Photo by H. Elsinga Woudenberg. Warga (Wergea), a village in Friesland, where Leenaert Bouwens baptized 21 persons in 1563-65 and 39 in 1568-82. The founding of the Warga Mennonite congregation may date from this time. About its history there is not much information, though church records have been preserved since 1732. In 1695 it joined the conference (Societeit) of Friesland, founded in that year. Until 1826 it was served by ministers chosen from their own members. The first minister serving here who was educated at the Amsterdam seminary was Sine J. van der Goot, 1826-1833, followed by C. Cardinaal Jr. 1834-1838, Joh. Pol 1839-1847, D. Plantinus 1847-1849, Taco Kuiper 1850-1852, R. J. Bakker 1853-1857, F. J. Klaasesz 1858-d. 1865, J. H. Uiter-wijk 1866-1867, J. P. van der Vegte 1868-1874, B. Haga 1875-1881, R. Kuiken 1882-1891, P. Sybolts 1892-1894, A. K. Kuiper 1895-1899, Corn. Vis Jr. 1899-1905, F. W. W. Braak 1906-1909, M. Onnes Mzn 1909-1911, R. J. de Stoppelaar 1911-1938, Miss S. E. Doyer 1943-1946. 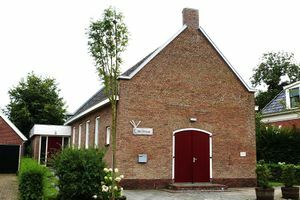 After the resignation of Miss Doyer the pulpit remained vacant; Pastor F. H. Sixma, first at Terhorne, then at Giethoorn, took care of the Mennonites in Warga until August 1954, when it made an arrangement with the congregations of Irnsum-Poppingewier to be served by the preacher of these congregations. Of the first meetinghouse nothing is known except that it was replaced in 1863. 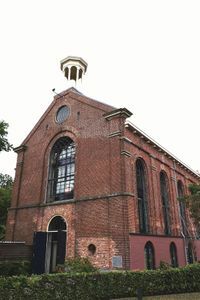 When this church became too large for the diminishing membership and moreover was dilapidated, a new meetinghouse was erected with the help of a Mennonite voluntary service group, dedicated on 18 November 1956. Church activities now include a ladies' circle. Cate, Steven Blaupot ten. Geschiedenis der Doopsgezinden in Friesland. Leeuwarden: W. Eekhoff, 1839: 89, 93 note 72, 189, 248, 254, 306. Doopsgezinde Bijdragen 84 (1900): 93. Reliwiki. "Wergea, Gele Eker 1 - Doopsgezinde Vermaning." 28 December 2013. Web. 14 October 2014. http://reliwiki.nl/index.php/Warga,_Gele_Eker_1_-_Doopsgezinde_Vermaning. Reliwiki. "Wergea, Kerkbuurt 10 - Doopsgezinde Vermaning." 28 December 2013. Web. 14 October 2014. http://reliwiki.nl/index.php/Warga,_Kerkbuurt_10_-_Doopsgezinde_Vermaning. Zijpp, Nanne van der. "Warga (Friesland, Netherlands)." Global Anabaptist Mennonite Encyclopedia Online. 1959. Web. 22 Apr 2019. http://gameo.org/index.php?title=Warga_(Friesland,_Netherlands)&oldid=134744. Zijpp, Nanne van der. (1959). Warga (Friesland, Netherlands). Global Anabaptist Mennonite Encyclopedia Online. Retrieved 22 April 2019, from http://gameo.org/index.php?title=Warga_(Friesland,_Netherlands)&oldid=134744. Adapted by permission of Herald Press, Harrisonburg, Virginia, from Mennonite Encyclopedia, Vol. 4, p. 887. All rights reserved. This page was last modified on 29 June 2016, at 16:19.